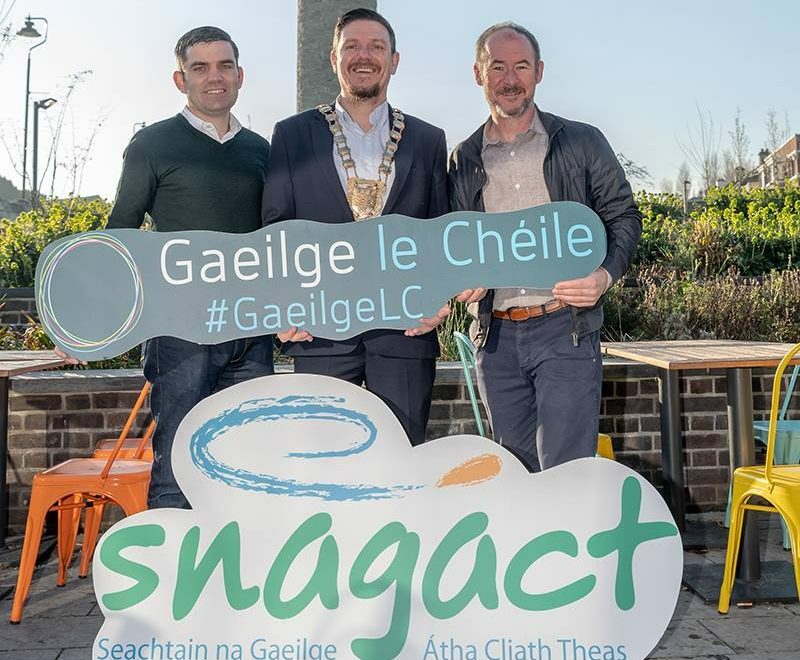 Tá áthas ar Chomhairle Contae Átha Cliath Theas agus ar Sheirbhísí Leabharlainne Átha Cliath Theas i gcomhar le Áras Chrónáin Seachtain na Gaeilge Átha Cliath Theas (SnaGÁCT) a thabhairt duit i mbliana. Is bliain uathúil í an bhliain seo go háirithe dár dteanga álainn laistigh de Chontae Átha Cliath Theas. Táimid an-bhródúil as ár Sráidbhaile Clondalkin féin a fheiceáil agus muid ag tnúth le haitheantas agus stádas oifigiúil mar ‘Líonra Gaeilge’. Bí ag faire amach don fheachtas feasachta a bhaineann le ra Líonra Gaeilge ’. Roghnaíodh an ciorcal mar lógó don fheachtas náisiúnta mar go ndéanann sé ionadaíocht ar phobail atá ag obair le chéile. Is í aidhm an fheachtais ná úsáid na Gaeilge a chur chun cinn trí Ghaeilge le Chéile – trí chéim shimplí, le húsáid a bhaint as Gaeilge Laethúil, I ngach áit, le gach duine. Sheol Méara Chomhairle Contae Átha Cliath Theas, an Comhairleoir Mark Ward an t-ábhar seo go hoifigiúil an tseachtain seo. Beidh an clár ar siúl ó 1 go 17 Márta. Tá os cionn 120 imeacht i bhféilire iontach na bliana seo, lena n-áirítear ceolchoirm speisialta le Kila, Céilí Lá Fhéile Pádraig, Gaeltacht Pop-up, ceardlanna sna leabharlanna, seisiúin cheoil thraidisiúnta, agus go leor imeachtaí siamsaíochta eile, a bhfuil an chuid is mó acu saor in aisce.